According to the Corporation for National and Community Service, helping others gives children and adults alike a sense of purpose and feelings of real accomplishment. 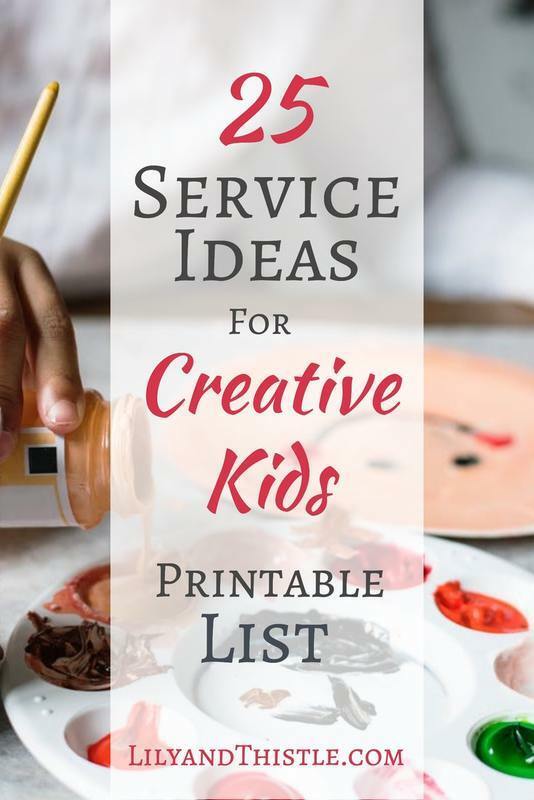 FYI, I put together a great list of service ideas for creative kids in the Resource Library you can get the password here. Serving others helps children learn about the world around them. Community service helps children (who are curious by nature), learn about their part of the world, how organizations work and gives them access to a variety of people from different backgrounds and ethnicities. Service can help children learn how to build lasting friendships and have tools for healthy future relationships. The best way to make new friends and to learn how to strengthen relationships is to commit to shared activities on a regular basis. 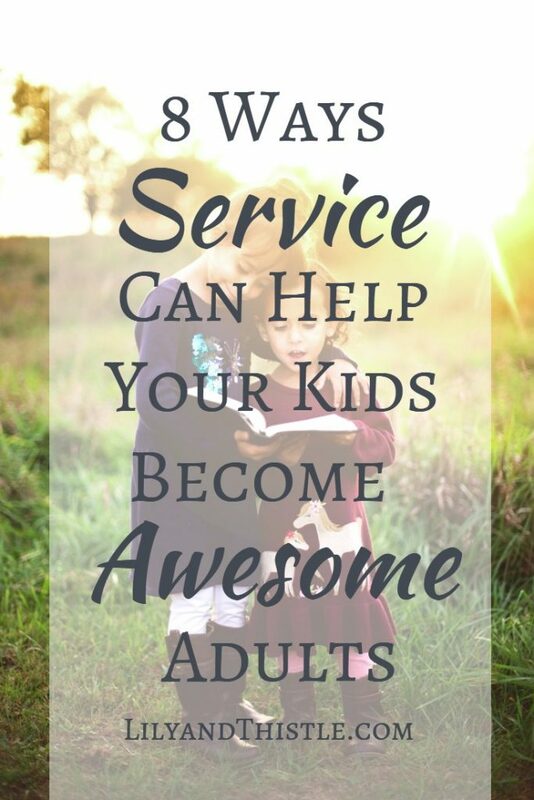 Service helps kids forget about themselves and focus on others while working side by side for a common goal. Service helps kids learn social skills. How often do we as parents hear about the importance of social skills (especially those of us who homeschool. If I had a quarter for every time…)? One of my favorite things about service to others is that there are no age restrictions. Through community service, children get a chance to mingle with older adults right on down to babies. They learn quickly how to adapt to each new friend and find common ground. Service helps children become more optimistic and thankful. In helping and uplifting others, they can’t help to feel uplifted themselves. “Helping others kindles happiness, as many studies have demonstrated. When researchers at the London School of Economics examined the relationship between volunteering and measures of happiness in a large group of American adults, they found the more people volunteered, the happier they were (source). Service also lets children see how fortunate they are and in turn feel more gratitude. Service can help your child find a path for a future career. What better way to learn what you love and what you are good at then through service to others? I volunteered as a Candy Striper (what a name!) at our local hospital as a young teen with my good friend. She loved working in that setting so much that she became a Physicians Assistant! I learned that I loved to make people smile and really enjoyed working on the displays in the gift shop. You never know what opportunities service will provide. FYI, I put together a great list of service ideas for creative kids in the Resource Library you can get the password here. Studies show service helps your child to be more healthy mentally and physically. Harvard recently did a study that showed that older adults who volunteer on a regular basis have lower instances of high blood pressure than their peers who are not consistently volunteering. They went on to theorize that service reduces stress, counteracts anger and anxiety which naturally increases health and well being both physically and mentally. It makes sense that when stress levels are lowered, health increases but it also makes sense that a lot of service activities are (wait for it….) activities! Meaning they make children (and adults ) get off the couch and actually do something with their bodies. Benefits of service are amplified when the service is performed without the thought of personal gain. This was important enough to note in the Harvard study and just makes sense. That being said, sometimes we need a little bit of motivation to actually take action so I’m hoping this list helps some of you with that (it certainly helped motivate me!). As a family, we have had some great experiences as we have tried to consistently do service. We really have seen some awesome benefits for our kids. As stated above, service is a great unifier. What kind of service have you done? What benefits have you seen? I’d love to hear!